Comodo Internet Security allows you to run programs inside the Sandbox on a 'one-off' basis. This is helpful to test the behavior of new executables that you have downloaded or for applications that you are not sure that you trust. Adding a program in this way means that it will run in the Sandbox this time only. On subsequent executions it will not run in the sandbox (presuming it passes the sandboxing process). If you wish to run an application in the sandbox on a long-term/permanent basis then use the Always Sandbox interface. 4. Click 'Run As' and select the restriction level you want to apply to the program from the menu. Untrusted - The application is not allowed to access any of the Operating system resources. The application is not allowed to execute more than 10 processes at a time and is run with very limited access rights. Restricted - The application is allowed to access very few operating system resources. The application is not allowed to execute more than 10 processes at a time and is run with very limited access rights. 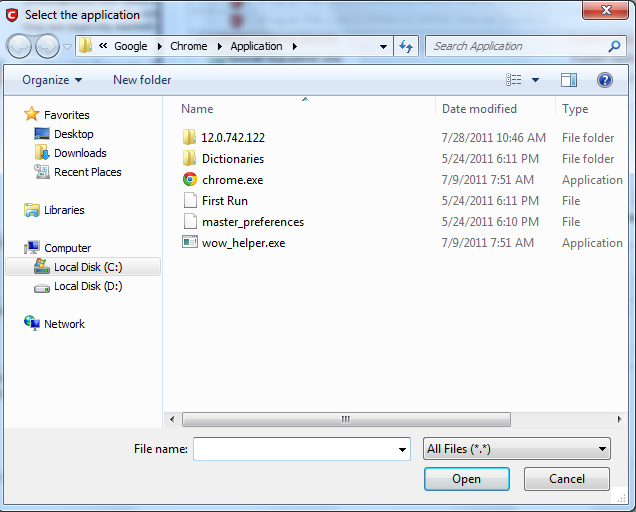 Partially Limited - The application is allowed to access all the Operating system files and resources like clipboard. Modification of protected files/registry keys is not allowed. Privileged operations like loading drivers or debugging other applications are also not allowed. The program is executed within the sandbox with the access restriction level that you selected. It will run in the Sandbox on this occasion only.